Everyone has a story. Most people like to share stories. Some are professional storytellers; authors, rappers, reporters, filmmakers. Through participatory media their stories reach many people, across a wide audience, sometimes all over the world. Are these “professional” stories any more important, any more interesting than the story that kid down the street just told her friend over the phone? Nah, they’re just packaged in a prettier way. While story telling as a profession is valuable and important, there is plenty of room for participatory journalism. Essentially, the person with the story to tell, tells the story! And usually, those listening or reading can relate to what is happening. It’s a first-hand account of what is going on in that particular community. To harness one’s creative spirit and provide a platform for self-expression and artistic outlet. To provide the tools and skills necessary for a person compose a story and report it in some form (written, photographic, etc.). CGnet Swara uses the cellphones people already own to report the news in and out of rural Indian villages. HitRecord is a free-to-join production company for artists to produce or share content with one another. And anyone who has Facebook, Twitter, Instagram, or other social media can report a story, in real-time as it is happening. Sourcing photo and video content from the people a non-profit is working with can be highly valuable. Not only the non-profit in terms of information gathering, but also for the people participating as a way to express themselves and tell their stories. Cameras have been given to non-profit participants before, to gather information without the middleman, and without the need for a translator or the sometimes-intimidating interview questioning. 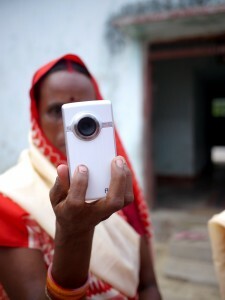 The people filming can interview themselves, their community members, and their families. They gather information about how a nonprofit is affecting the community, both positively and negatively. 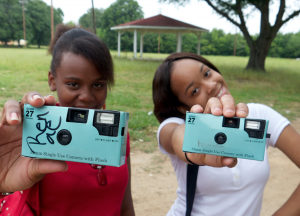 I’ve had the pleasure of implementing Community Photo and Video Projects in various locations with different groups. Below is a link to a documentary created almost exclusively with the content filmed by women participating in Heifer India’s Cornerstone Programs. The footage was shot by women who have never seen a movie, nor ever held a camera. Their accounts are honest and indicative of the changes that have occurred as a result of Heifer’s collaboration with the community these women live in. For more information, here’s the Community Photo Manual, an in-depth PDF. For more information on how to facilitate a Community Photo or Video Project, or a facilitation manual, contact maggieecarroll@gmail.com. Maggie Carroll is a news reporter and anchor at KUAR News, as well as assistant extraordinaire to filmmaker/photographer, Dave Anderson. She recently graduated with a masters from the Clinton School of Public Service and freelances in photo, written, and video journalism. She enjoys facilitating community journalism projects and sharing stories. Maggie also enjoys Mexican food and Star Trek.